Last summer the vicar and the local community surrounding St Oswald’s Church, Preesall, Lancashire, played a central role in filming for a new Jamie Oliver series. And tonight (Friday January 17), the programme will air on Channel Four at 8pm. 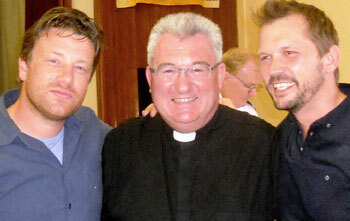 Originally called Food Fight Club and now renamed as Friday Night Feast the programme, also featuring celebrity chef Jimmy Doherty, came to St Oswald's Church on August 13 and 14 for two days of filming. The duo were making a series of films about ‘lost foods’ in the UK and the Lancashire filming is about the little-known Tosset Cake, a biscuit that's flavoured with caraway seeds and coriander seeds. When the programme has aired it will be available to watch on Channel Four’s on–demand service 4oD, available here. The cake is local to Stalmine and Preesall and dates back centuries; most likely linked to the old wakes holy day celebrations to mark the feast day of St Oswald. Local vicar, Rev Shaun Baldwin, even had a go at baking the cake himself for the programme. This week he said: “Jamie’s visit was a fantastic moment for the community and a great catalyst for the revival of an old traditional festival rooted firmly in the church’s history, which came about originally as a result of the importance the church has always played, and continues to play, in the local area. “The revival and filming of the Tosset Feast was a great experience that brought together all sections of the Over Wyre community. We think that this was the first celebration of the Tosset Feast for over 100 years. Rev Baldwin went on to explain the origins of the name: “We think that 'Tosset' is a corruption of 'St Oswald'. There has been a place of worship in Stalmine since around 1240AD and the parish was originally dedicated to St Oswald before the existing church was built and dedicated to St James in 1806. For a first-hand report about the filming from Rev Baldwin, click here. Mix together and leave in a fridge for 2 hours. Then roll out the mix to a maximum thickness of two £1 coins, cut into individual pieces (traditionally circular biscuit size); place on a baking tray and bake for 20 mins at 170/gas mark 3.